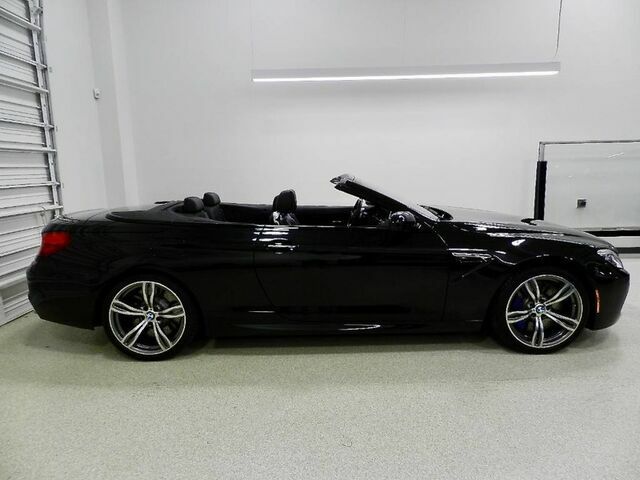 2018 BMW M6 CONVERTIBLE The Ultimate Driving Machine strikes again with this 4.4 Liter BMW M Twin Turbo V8 convertible. Black Sapphire Metallic over Black Extended Merino Leather. Driving Assistance Package (Active Blind Spot Detection, Active Driving Assistant, Head-Up Display), Executive Package (Heated Steering Wheel, Front Ventilated Seats, Active Front Seats, Bang & Olufsen Sound System), USB & Bluetooth, M Double Clutch Transmission, 20" M Forged Wheels, Rear View Camera, Soft Close Doors, Carbon Fiber Interior Trim , Ambiance Lighting Adaptive Full LED Lights, and so much more! Original MSRP $132,000!!! SAVE TENS OF THOUSANDS OF DOLLARS! CarFax Certified ONE OWNER Garage Kept! Meticulously maintained! Full BMW Factory Warranty until June 2022 or 50k miles Leasing / Financing Options Available Trade Ins Welcomed - Door to Door Enclosed Transportation Available Color Change Vehicle Wrapping, Paint Protection Film, Ceramic Coating Available! For more information call or text 727-423-7819 or visit www.zenmotorsports.net for more information ZEN MOTORSPORTS... RESTORING PEACE OF MIND TO THE CAR BUYING EXPERIENCE! !